As weekend perfumers we recognize the importance of keeping track of experiments with perfume formulas and their variations. While for the most part we don't have too much pressure with respect to making our samples look professional there are some simple tricks that can make our roll ons and sprays look elegant. A very basic labeling machine can make our life a lot easier. 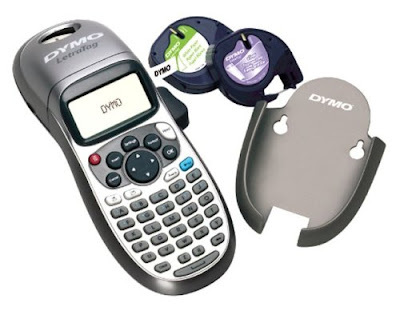 I am using DYMO® LetraTag LT-100 Plus Handheld Label Maker ($32) to print white or transparent labels. These labels are water/oil/alcohol resistant. You can select the letter size, print on two lines and add special symbols. There are fancier models available but even the basic one can do a very good job. Also here are some links to my favorite roll on dispensers (good for oil perfumes) and spray misters (alcohol based perfumes).